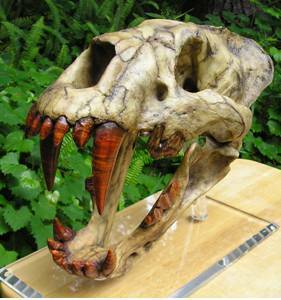 American Scimitar Cat Fossils, Facts and Photos. The Scimitar Cat is a smaller and rarer relative of the Saber-Toothed Cats; it mainly was an ambush predator, preying on young Mammoths. It had longer front legs and shorter back legs, with a sloping back. Not only was it built for ambushing, but it could possibly reach speeds of 60 mph (96km/h) in short bursts. An unusually large, square nasal opening, much like today’s Modern Cheetah, suggests its ability to take in large amounts of oxygen very quickly. It had finely serrated canine teeth that were razor-sharp and shorter than the Saber-Toothed Cats. Its long and well-defined skull crest gave it powerful muscle attachments for its lower jaw. They had short tails like a Lynx. The size of an African Lion, it had a height of 3.3 ft. (1M) and weighed 330-550 lbs. (150-250 kg). Widespread in North America, they lived 1.5 Million Years ago and went extinct about 10 thousand years ago. A cave painting in France suggests it may have had fine spots on its body and sheathed canines, with a light colored underside. 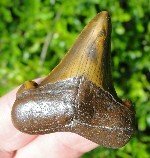 In 1981, in Florida, a Xenosmilus hodsonae was found. It was a robust Scimitar, with short legs and very stout canine teeth. Two specimens were found in the Haile Limestone Quarry in Alachua County, Florida. This cat may have specialized in hunting and eating Peccary.